Dumplings. One of my favorite foods in the whole world. They're just so, so, so delicious. They have many names - potstickers, gyoza - but are often quite similar. And honestly - NOT hard to make at home! It took me a long time to try them, but after having eaten them many times at Dagmar's home, and helping her fold them too, I made them for myself and it was just fine. You can buy ready-made dough (frozen) in some Asian supermarkets, but it's so easy to make your own. A pasta machine comes in very handy though, and a large glass for cutting out circles. And you need a frying pan with a lid. 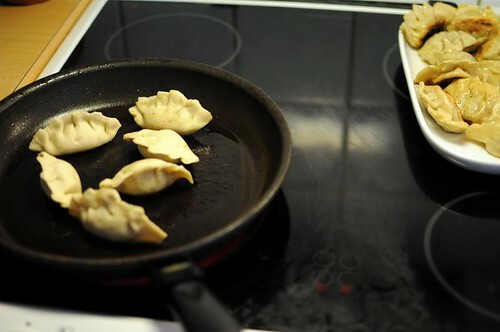 You can freeze the finished, uncooked dumplings, and then just cook them directly from frozen. So make a big batch! Meanwhile, make your filling - feel free to experiment! 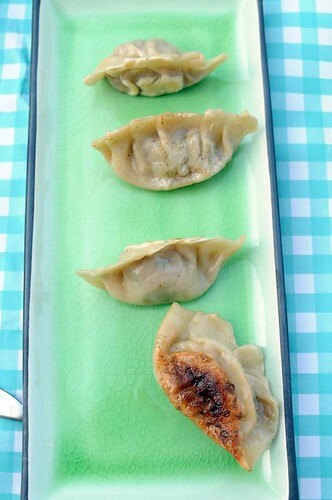 My boyfriend loves Dumplings, so these are a MUST try! Thanks for the recipe! !